I recently got asked about how to replace the covering on a footstool. It isn’t a hard process and this makes for some lovely needlepoint. There are three steps to this process, neither particularly hard. The first step is to measure the footstool. Do you still have the old top? If you do measure the length and width with the top on, so you know how much padding there is. Detailed instructions on how to do this can be found on All about Needlepoint. Your measurement plus about 1/4″ all around will be the finished size of the stitching. Mark that shape onto your canvas with something like an Extra Fine Sharpie or, better, a Pigma Micron marker. Let dry overnight. The second step is to stitch the needlepoint. You have tons of options here, but I’d like to suggest three. 1. Repeat the original pattern if you can find it. 3. Find a vintage needlepoint pattern you like. Here onNuts, I’ve been recharting designs by Anne Orr, who was popular in the 30’s-50’s, so her patterns have a vintage look. You find them under the category vintage needlepoint. Once you have stitched the needlepoint, block it and use it, as you would fabric, to cover the footstool. You can do this yourself. Instructions to do this with a screw on top are at the end of the same All about Needlepoint article. eHow has detailed instructions for recovering round footstools and on using tacks to do this process. You need to use this method for any footstool where the top is not easily removable. The only company I know of that makes foot stools for needlepoint is Sudberry House, but I don’t know if they make this size. 1. Find a footstool that size and recover. 2. Make a footstool to fit. I know there are DIY blog posts that tell you how to do this. I;d do a Google search for them. Thx Janet, the largest I could find was 12×12 and my octopus is 18×18! I’ll keep searching but appreciate your help. Happy holidays! Question: what sized mesh and type of canvas is best for this type of application? Is all wool fiber the way to go? Yes, wool is the best thread to use. Single-strand ones will look best because they won’t snag as much. If you are using single strands of Persian-wool, I would suggest 14-mesh. If you are using Tapestry wool, use 10 or 12 mesh. Mono canvas is your best bet, although Penelope would also work. Do not use Interlock canvas as it distorts easily and is very thin. I am wondering if I use a larger mesh, can I use a worsted wool? Is there a good reason not to? I will be stitching a cover for a small stool, which will include a blocked space for Initials……I appreciate all the comments here and your expertise. 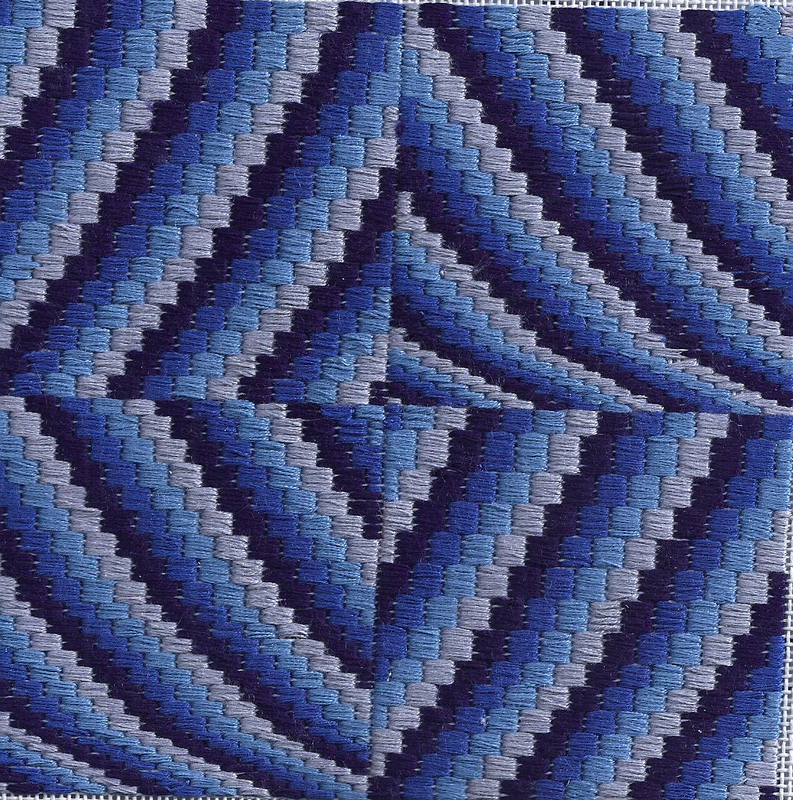 Worsted is pretty thick for needlepoint canvas and you’ll need to use 10 or 12 mesh canvas. I find sock-weight yarn is great for straight stitches on 18 and diagonal on 14, so that’s what I mostly use.